Home Politics Chavismo Lara: Venezuela’s Ohio? This has been a frantic week in the streets of Barquisimeto, my home town. Supporters of the two main candidates made their presence felt with constant blaring music. The local headquarters of the two camps buzzed all week with people looking for sample ballots and promotional kits. If you want to know why tomorrow’s vote promises to be so close, you’d do well to start here. Six years ago, Chavez won Lara by a 2-to-1 margin. That was just a function of his landslide victory nationwide. Chavismo had full political control of the state, with the governor and all nine mayors coming from their camp. That’s all a distant memory now. The political landscape has transformed, and so has everyday routine. With perhaps the most popular regional leader in the country stumping hard for Capriles, Lara could just be the election’s tipping point. Chavismo had two main leaders in Lara. One was Luis Reyes Reyes, State governor from 2000 to 2008. A military man, he is fully loyal to Chavez and part of his inner circle. Whatever he was told to do, he did it, no questions asked. Unfortunately, governing was not his strong suit. He wanted his son Luis Jonás to be his replacement, with the boss’s blessing. The other was Henri Falcon, mayor of Barquisimeto in the same period. Falcón is a more independent-minded figure with an approach to issues that made him attractive even to opposition voters. Instead of focusing on polarization like Reyes Reyes, he believed in cooperation. He was the natural choice to be the next Governor, according to the polls. Falcon went public with his aspirations, and soon the governing PSUV kicked him out. Shortly afterward, they retracted. They knew that without Falcon, their options to retain the governorship were slim even with the oppostion split in two. They took him back and he delivered the largest victory margin in the regional elections of 2008. As a concession, Falcon accepted a Reyes Reyes loyalist, Amalia Saez, as candidate for Mayor. She won by a narrower margin. Still, the break-up was inminent. Reyes Reyes became a minister in Chavez’s cabinet and put pressure on Falcon, who finally quit the PSUV and joined the allied party PPT. He inmediately decided to embrace the role of the third option for those tired of Chavismo’s flaws but, at the same time, unable to trust the opposition (which at the time was starting to become the MUD). Even if the PPT won two deputies in Amazonas (thanks to another runaway governor from Chavismo: Liborio Guarulla), they realized that the “third option” angle didn’t work well with voters. Something had to give. Falcon knew that he needed the opposition but he didn’t trust his former adversaries. The opposition in Lara needed him more, as they didn’t have a leader of their own and their internal splits were damaging their future electoral options. But they were afraid of Falcon being another Arias Cardenas-like double crosser. So they started a long and slow courtship to build confidence. The key moment was the presidential primary. Falcon decided not to run, endorsing Henrique Capriles instead. Falcon’s support of Capriles was a key asset: a governor from the left supporting another governor perceived as center-right. That helped Capriles to position himself in the center and becoming the best alternative to defeat Chavez, the one figure who could unify the opposition and therefore, the country. The gamble worked in Lara and everywhere else. Meanwhile, Chavismo in Lara has dedicated itself to two things: bringing down Falcon no matter what, and taking Reyes Reyes back to the governorship. Through the Lara State Legislature, and with some help from Caracas, they have launched multiple investigations against the governor and have taken various areas of responsibility away from his office. The Chavernment itself has increased its presence as well: PDVAL and Mercal outlets are everywhere and “CDI” outpatient clinics can be found at key locations. This year, Chavez decided to turn the central government’s regional development agency (CorpoLara) into a parallel governorship, with Reyes Reyes at the helm. As the political landscape changed here, our day-to-day life took a drastic turn as well, and not for the better. Problems that were once just restricted to Caracas started to become normal, not only in the State capital or the nearby suburbs of Cabudare, but even in smaller towns like Carora or Sarare. Lara is a peculiar state. There’s no oil or other natural resources, so the economy is more diverse: agriculture, industry and commerce are the engines of this land. Its geographical position make us the “crossroads” of the nation: where Llanos, Andes, Zulia and the Central Region all meet. As these sectors started to suffer the consequences of “21st Century Socialism”, the effects were felt right away here. Food imports and land expropiations have hit local producers. The coffee of Sanare and the onions of the Quibor Valley have lost room in the market to overseas products. Industrial areas of Barquisimeto are nowhere near fully active, and many locations are closed. The Chavernment now wants to transform some of those into residential areas, even if the financial cost of such an enterprise goes beyond any common sense. In fact, housing has pushed organized squatting front and center. Chavismo has allowed squatters to have free range, but sometimes things didn’t go according to plan. The latest housing program is working overtime to fill the gap somehow. Our postion as the “crossroads” of the country has been compromised by failing infrastructure. Then, there’s crime. Violence has taken over the streets of Barquisimeto and other towns. A special case is El Tocuyo, the third oldest city of Venezuela, which has seen it increase at an alarming rate. But the issue that has confirmed how life here has changed is the electrical crisis. Planned or unplanned, blackouts are now part of our everyday reality. The Capriles camp took notice and started to work hard around the state, not just to win the primary, but as a possible swing state in October 7th. The candidate himself came to Western Barquisimeto, once a strong bastion of Chavismo, several times. He launched his campaign here in late April. He visited almost every town of importance in Lara, with the exception of two municipalities: Palavecino and Simon Planas. He doubled down in September by having three major rallies here: launching a part of his economic plan, a huge concert to rally the youth vote, and ending his campaign right in downtown Barquisimeto. If there’s a state where the Comando Venezuela has made a major move during the campaign, it must be Lara. Meanwhile, Chavismo filled every available space with his old picture, the comandante presidente held two major rallys in Lara: one in July and the other days ago. Both were held in small avenues of Western Barquisimeto. Chavismo believes they can keep Lara in their column, even if they could see some substantial losses in urban centers. Falcon has been a big part of this strategy and when the idea of naming the VP before the election came up, he was considered the front-runner. Chavismo tried to weaken him when they name squatted on the PPT handing control of the party to a chavista faction, but now he has his own political party up and running. Falcon’s popularity has hurt local Chavismo, who hasn’t found a figure able to replace him (Reyes Reyes is like Ameliach, boring…). His appeal could help make small inroads in neighboring states like Yaracuy and Portuguesa (stuck with unpopular Chavista governors). If 2010 proved that the Falcon effect split the vote in three and eroded Chavismo’s advantage in the end, this could be the chance to give the opposition a decisive lead. 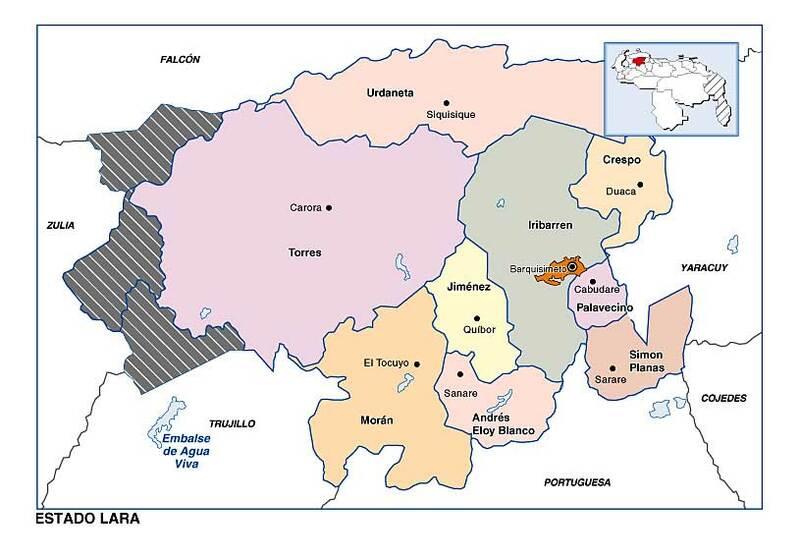 Lara isn’t the only swing state in this election (Anzoátegui, Monagas, Aragua and Bolivar could be considered ones as well), but it can be seen as the most representative case given recent history and current enviroment. Lara serves as a microcosm of the country, and its outcome could be decisive for whoever wins on Sunday.